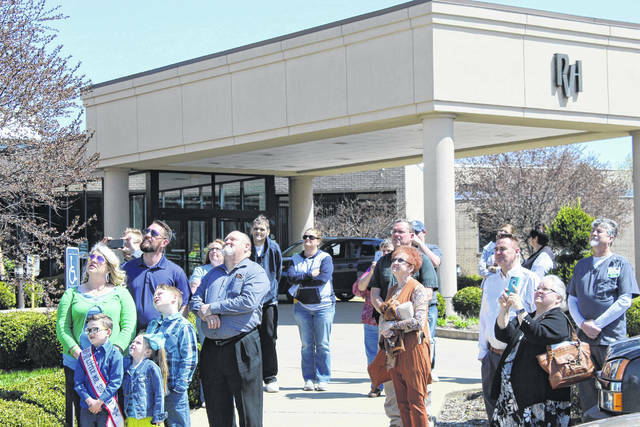 Onlookers at the National Donate Life Month ceremony watch as the Donate Life flag is raised. 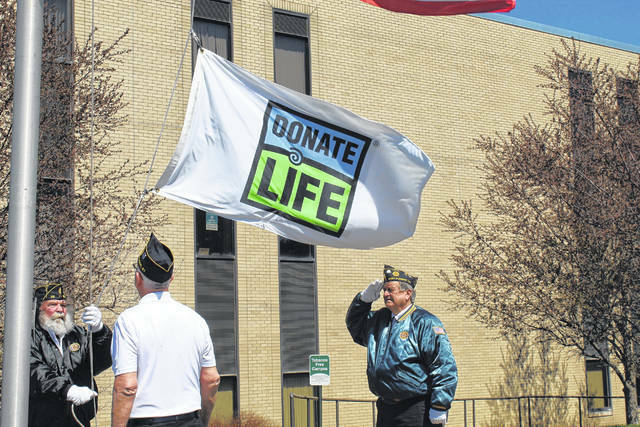 Members of the color guard from American Legion Post #23 in Point Pleasant raise the Donate Life flag. Jane Layton shares her story and support of organ donation. 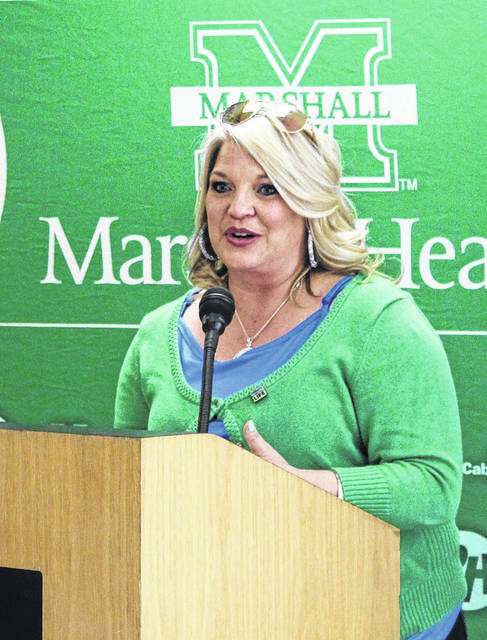 Brandy Barkey Sweeney speaks at the recent National Donate Life Month observance. Karen Jodon speaks about her liver transplant as Jane Layton, who received a kidney, listens. POINT PLEASANT — Life can be a beautiful ride but that doesn’t mean the road will be smooth. “Life is a Beautiful Ride” is this year’s theme for National Donate Life Month, a time of year meant to raise awareness about the importance of organ donation. 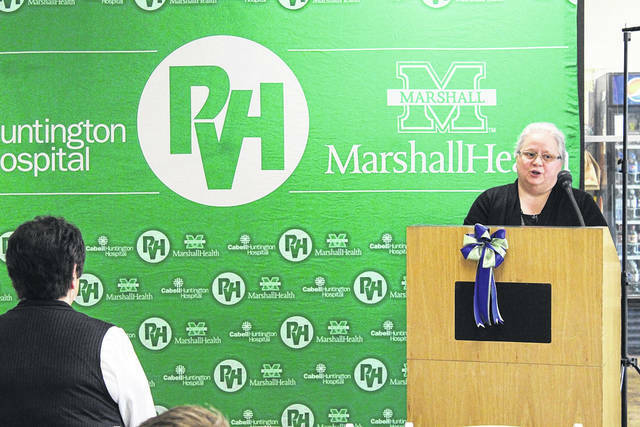 Each year, Pleasant Valley Hospital, in partnership with the Center for Organ Recovery and Education (CORE), host an observance featuring remarks by those affected by organ donation. PVH CEO Glen Washington gave opening remarks and introduced each speaker at this week’s ceremony, including Jane Layton. Layton spoke about her journey to receive a kidney, after being ill for five years in a battle that included diabetes. She was diagnosed in stage four kidney failure and then end stage. In January 2015 she began dialysis but afterward had a heart attack that required a significant bypass and therefore wasn’t able to go on the transplant list for another year. She eventually made it onto the list, calling it “a process.” There were more ups and downs, including hope from a friend who wanted to donate a kidney but then had unexpected health issues that derailed that plan. Legally blind from the diabetes, Layton couldn’t drive and many days didn’t feel well enough to do what most healthy people take for granted. She said a church friend told her “it’s okay to pray for your own miracle.” Three weeks after these prayers, she received the call from The Ohio State University Medical Center where she received her kidney. Layton’s recovery was best-case scenario, expecting to be in the hospital 10 days but only staying four. She spoke about the second chance on life she’d been given, to spend time with her husband and son and to live a normal life. Karen Jodon, diagnosed with a genetic disease that can cause irreversible damage to the lungs and liver, ended up with cirrhosis of the liver. The only way to overcome that grim prognosis is through a liver transplant, which she received in May 2016, following a diagnosis that happened in March 2015. She lost a brother in 2014 to cirrhosis and the same genetic condition that caused it. Due to other complicationss, he was unable get on the donor list. She began to have troubling symptoms but with memories of her brother’s death, was hesitant to go to the doctor at first. Her fear was confirmed and she ended up in end stage liver failure, followed by a rapid decline in her health. She said she couldn’t eat well, she was exhausted all the time and after 27 years of working at one place, she had to make the “difficult decision” to step away from her job. After much research, she found the “only answer” was a transplant but “getting on a list turned out to be very difficult.” After feeling drawn to the University of Virginia Medical Center, she was able to get on a waiting list there, but the wait was discouraging due to her disease’s progression. “At that point, I was too week, I know God was there but I was too weak to carry myself to God, I had to depend on the prayers of others,” she said. Following many prayers, Jodan finally received the call and she went back to Virginia where she was told a perfect match was found. Jodan said she was rejoicing but aware another family was feeling something much different. “It’s not fair to be so happy that I’m going to live and this person sacrificed his life,” she said of that mix of emotions. Like Layton, Jodon’s recovery went smoothly and “God and my body had a different idea” on expected complications that never arrived. Jodon will be observing her third year with the new liver on May 18. “You don’t know what life is until you’re so close to death’s door and God gives you the opportunity to live again,” she said. 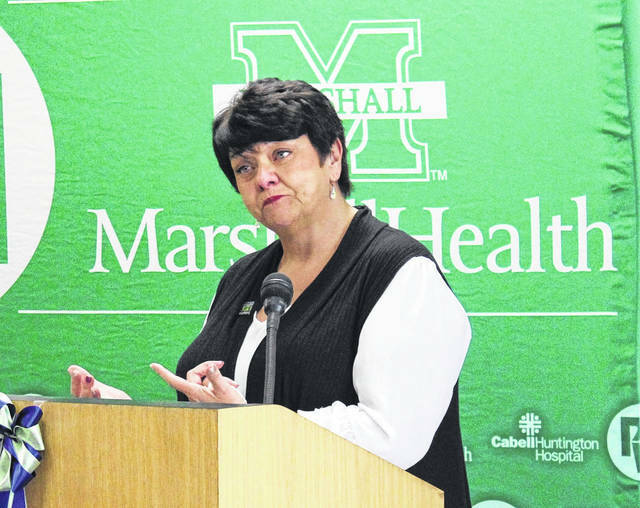 The event was the first time Jodon spoke about her transplant, publicly, but like Layton, felt she needed to encourage people to donate the gift of life. Following the procedure, Sweeney eventually made contact with her donor’s sister through social media. She learned her donor was a hero to not only herself, but to others through his multiple organ donations. With her husband Brandon and children Bryson, Braydon and Braylon watching her share her story, she said the decision was made early on to “not lay down and cry” about the hand she’d been dealt. She and her family instead put “faith in God,” echoing the sentiments of her fellow donor recipients. Leading the invocation and prayers was Pastor John Holland with remarks from Christy Conley, Community Outreach Coordinator CORE Liaison. Members of the color guard from the American Legion Post #23 of Point Pleasant, assisted with the flag raising ceremony outside the hospital.